When you play at Hard Rock Rocksino Northfield Park, you may not win every time, but you're guaranteed to have a great time no matter how the games play out. When you walk through the doors of our 200,000 square feet of gaming space, let the thrill of the night wash over you and get ready for the time of your life. The first of its kind right here in Northeast Ohio, our new RockStop is a rock ‘n’ roll branded, state-of-theart gas service station and car wash. It’s a unique amenity with unparalleled benefits, offering Rock Star Rewards loyalty program member discounts on gas purchases and car washes and the option to pay with points. 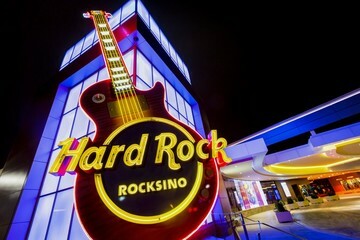 The pumps feature Hard Rock style lighting effects and LED TV’s which broadcast music videos and commercials. The RockStop features a car wash with soundtracks for guests to enjoy and a full retail store including Limited Edition Hard Rock Merchandise!